Exploding with color, textures, patterns, and ideas, this guide to the best of Mexican decor is packed cover to cover with splendid eye-popping photos. From Costa Careyes to the Yucatan Peninsula, this diverse selection of villas, casitas, haciendas, cabanas, and palapas paints a multihued picture of Mexican style. 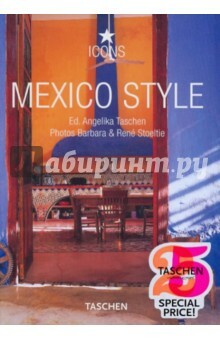 Редактор: Angelika Taschen. Фотографы: Barbara and Rene Stoeltie. Издание на английском, французском и немецком языках.